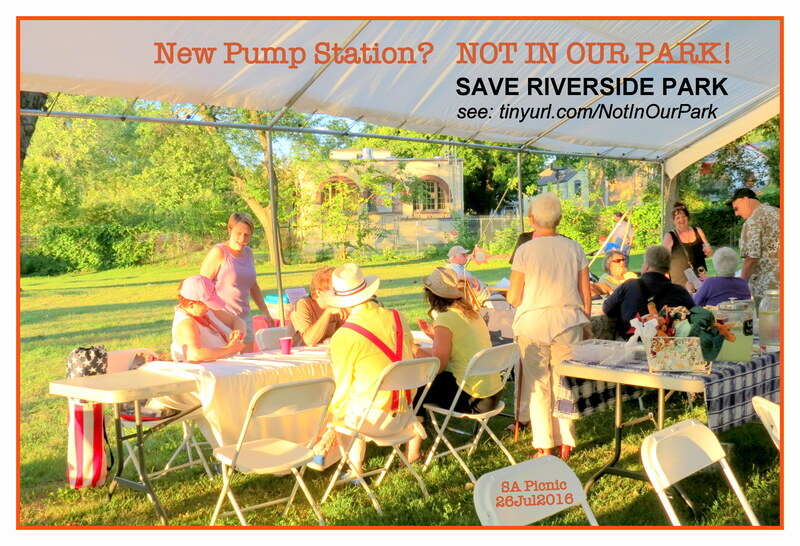 Yesterday evening (May 2nd), concerned members of the Stockade community demonstrated clearly that they stand opposed to putting a new pumping station in Riverside Park, with thoughtful and heartfelt reasons for defending their beloved Park and Stockade neighborhood. [see the article in the May 3, 2017 Gazette by Brett Samuels]. Immediately below are links to related materials, especially images of our very special Park. Below that, is a detailed description of the main points expressed and information received at the May 2nd meeting. 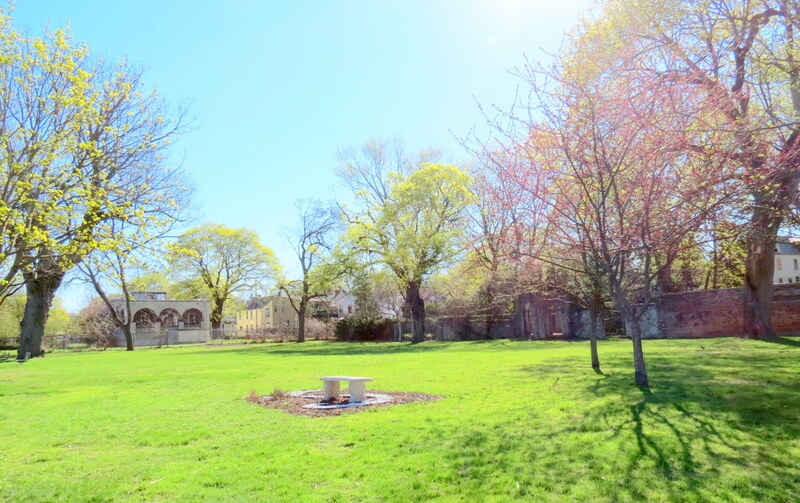 See “the at-risk West Lawn of Riverside Park” for many images of the Park and the proposed Plans from the City’s engineering firm, CHA. 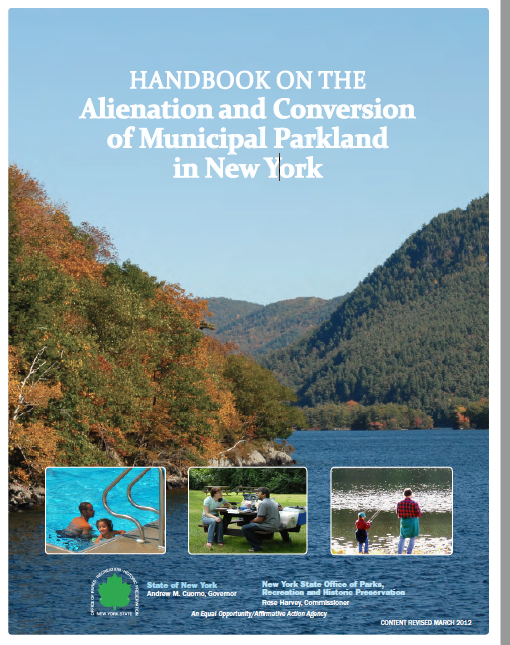 Check out the “Handbook on the Alienation of Municipal Parkland in New York” from the State’s Department of Parks, Recreation & Historic Preservation to see how a City is supposed to go about deciding and asking permission on taking parkland for a non-park use. The Checklist provided (pp. 51-52) is a good place to start for an overview of the process that the City of Schenectady has ignored or distorted. display our 3 “photo OpEds” to Save Our Park. Cast of Characters with “official” Roles at the May 2 meeting: Suzy Unger, SA Board member and Recording Secretary, was the emcee. 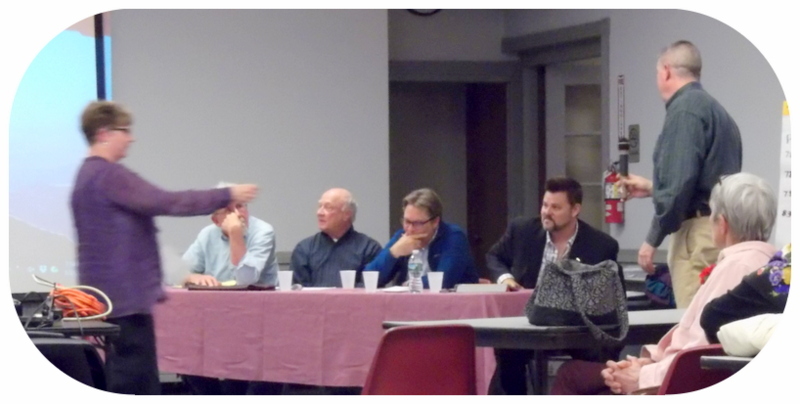 The panel consisted of Mark Miller, the lead engineer on the project from CHA Consulting [Clough Harbour Associates, “CHA”]; Brad Fisher, who lives at 27 Front Street, a directly affected property; Larry Schmidt of 11 Front Street; and Fred Heitkamp, who has lived on North Street since 1969. Paul LaFond, Schenectady’s Commissioner of General Services briefly spoke. Carol DeLaMater, SA President and Bob Stern, SA Corresponding Secretary, also contributed. Larry, Fred, Carol and Bob were the “community members” who were invited by the City and CHA to be on the so-called Community Advisory Committee that attended the private “workshop” sessions about the Project. Gloria Kishton, Stockade Spy co-editor this past year, and President of the Schenectady County Heritage Foundation, tended a flip-chart where she recorded comments. Vince Riggi, Independent member of the City Council, was in the audience and was the only Council member present. There were no prior public meetings. There were closed meetings with a small number of Stockade residents selected by City officials and the engineering team. Mr. Miller from CHA said he considered them to be workshops. 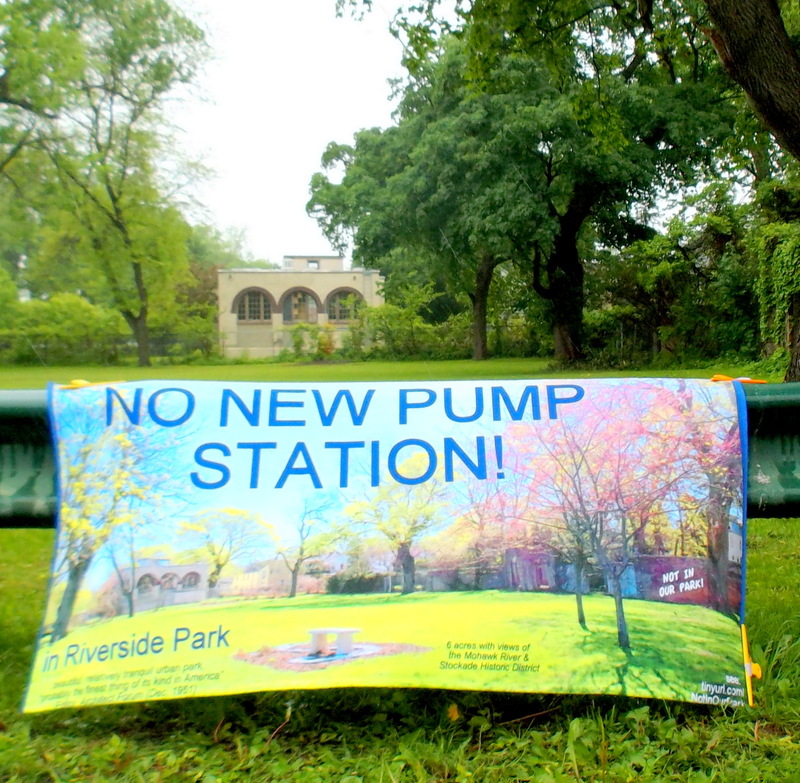 Not one of the invited residents lived along or owned one of the 6 properties bordering the stretch of Riverside Park where the proposed pumping station would be located. Locations outside the Park were not under presented to or under consideration by the Community Advisory Committee. 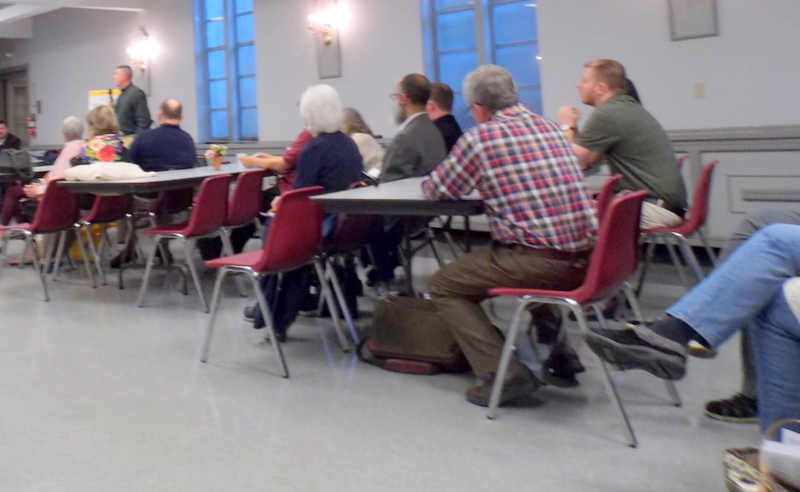 More than forty Stockade residents came to the meeting. None of them voiced any support for the first set of designs (the March 1 Presentation to the Stockade Association Board). 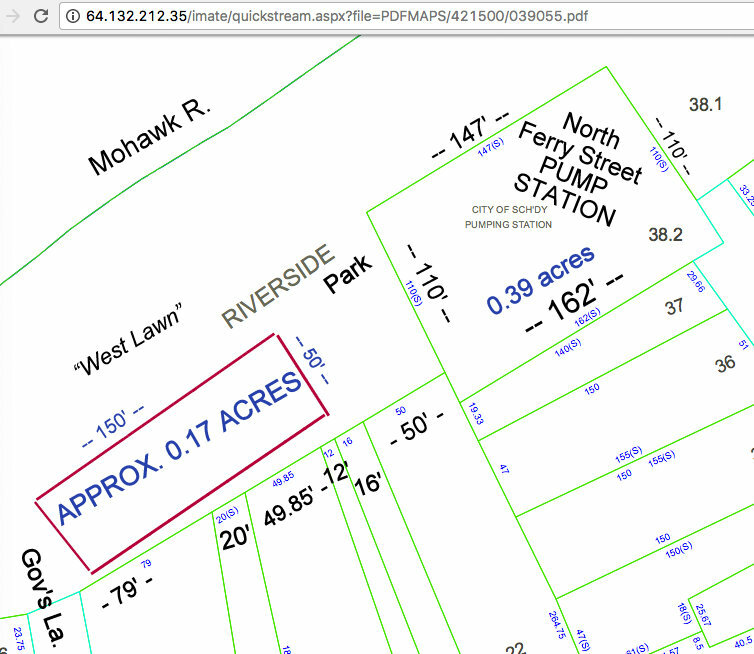 All statements by non-panel members and non-SA-officers opposed locating on parkland; most stated a preference to retrofit the Old Pump House and use the additional space on its lot. Others said off-Park locations and those outside of the floodplain should be considered. Werner Feibes, Schenectady Patroon, Founding Co-Father of the Stockade Historic District, retired architect and longtime Stockade resident, stated that parkland should not be used, and asked just why the Old Pump House location could not be retrofitted. John Samatulski, engineer, Stockade property owner and developer, strongly opposed using parkland, and the present design for the pumping station, and wondered if the City could so easily be allowed to alienate parkland. 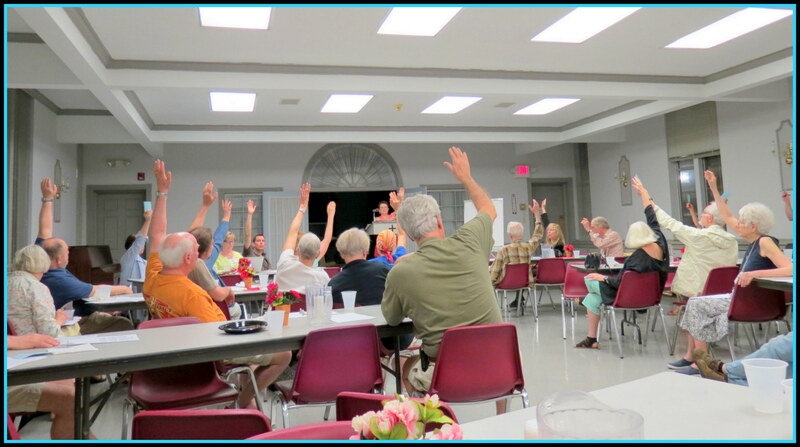 John asked people to raise their hands if they were opposed to the March 1st Project Presentation (locating the pumping station on the West Lawn); the vast majority of people in the audience raised their hands. 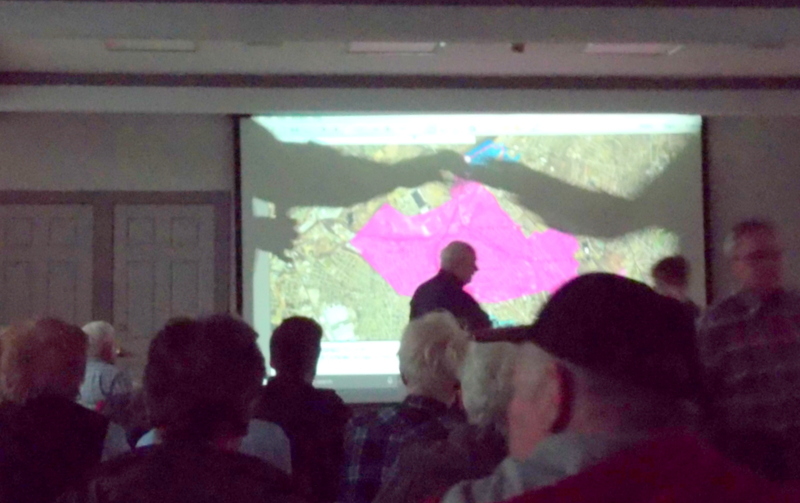 Larry Schmidt, Advisory Committee member and resident, presented slides showing other possible locations that were also near the main sewage lines, such as behind the Historical Society, where the former Ann St. location had warehouses, which might be incorporated into the design scheme. Rich Unger, Stockade resident and retired urban planner, asked for cost figures for the alternatives. He also stressed the “environmental cost” of damage to the enjoyment of historic places and parkland, and the nature of the community. David Giacalone [editor of suns along the Mohawk] noted he lived one short block from the west end of Riverside Park, and that 1) the relative lack of activity on the West Lawn was a reason not to disrupt it with a pumping station; 2) praise for the special tranquility of the Park has come from many sources, including the City Council, in a 1998 resolution, which also stated that “to change its special nature would deprive visitors and disadvantage the homeowners who are the caretakers in this Historic District of national importance.” 3) We need to protect the unique views of the rear of Stockade homes, with long, terraced lawns and gardens and attractive walls, and more. NYS DEC Visual Impact Assessment requirements come into play here, because the project is abutting an historic district “aesthetic resource”, is clearly within its viewshed, and cannot be adequately mitigated without using the option of relocating the project from behind the Stockade residences. Indeed, if Gov. Joseph C. Yates still lived on the corner of Governor’s Lane, would a pumping station be proposed right behind his garden wall? The claim by Corporation Counsel that this project is “exempt from SEQRA” because it comes under a Consent Agreement appears to be very shaky. The Type 2 list of actions deemed outside SEQR review does mention court or consent agreements, but the provision of SEQR refers to “a particular course of action specifically required to be undertaken pursuant to a judgment or order.” SEQR §617.5(c)(29). The City is under an obligation to solve various sewerage system problems, but the Consent Agreement does not require any specific action, much less a specific location. 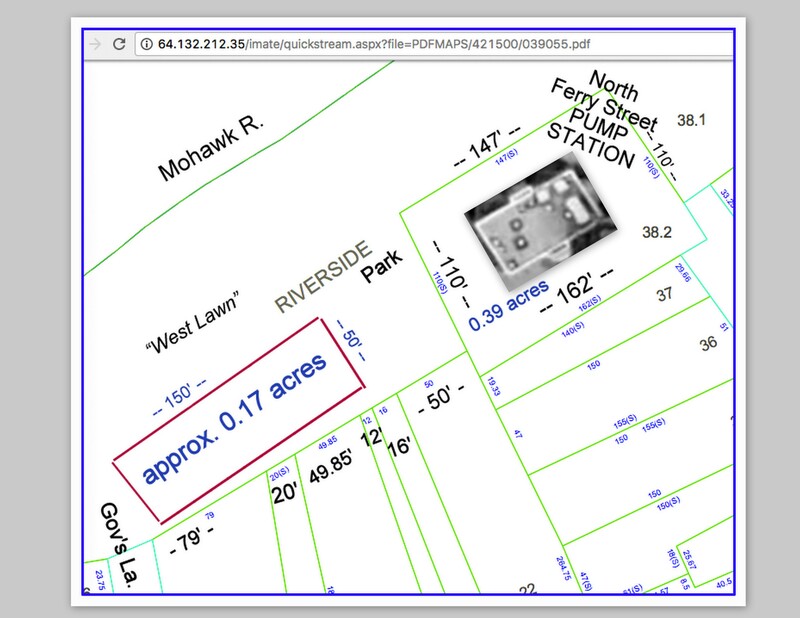 That means that NYS DEC Visual Impact Assessment policy does apply, and the adverse effects on both the Park and the Stockade Historic District must be avoided an alternative location is reasonably available. Jean Zegger, long-time Governor’s Lane resident, said she had the best view around of the River and would lose it with the current proposed location. She also praised the special tranquility and beauty of the Park; and asked in what ways the community advisors had “influenced” the design, as stated in the March 1st presentation document. Carol DeLaMater, SA President, noted she lived near the west end of the Park and “agreed with David[ Giacalone’s]” statement about maintaining the tranquility of that part of the Park. 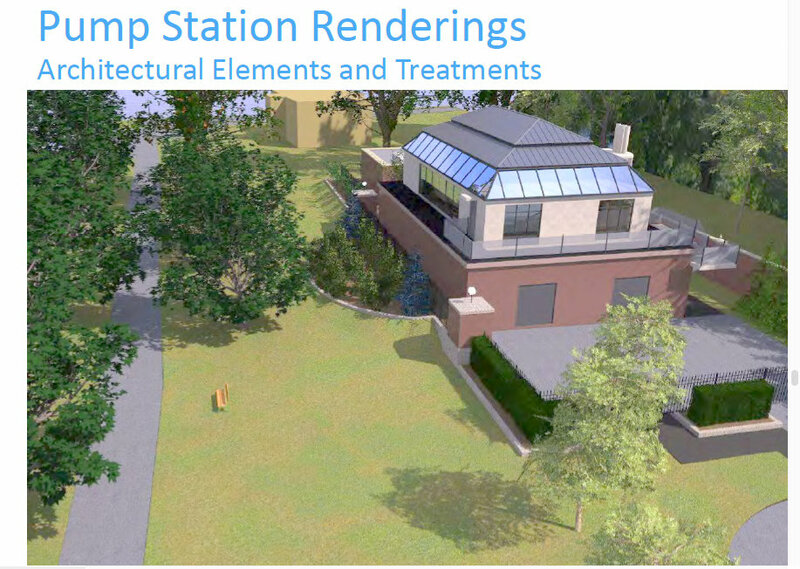 CHA understands the sensitivity of the Stockade community and is working to reduce the footprint of the project and minimize blocking of the views from the properties (by reducing the height; doing away with concrete loading/parking area; placing dry dock area within the main structure, rather than next to ii; “dramatically reducing” the upper platform of the pumping station). See this mock up of the “dramatically reduced footprint” claimed by CHA and the City. The rectangle shown in red is smaller than 0.2 acres, but suffers from all the issues that the larger version raised. 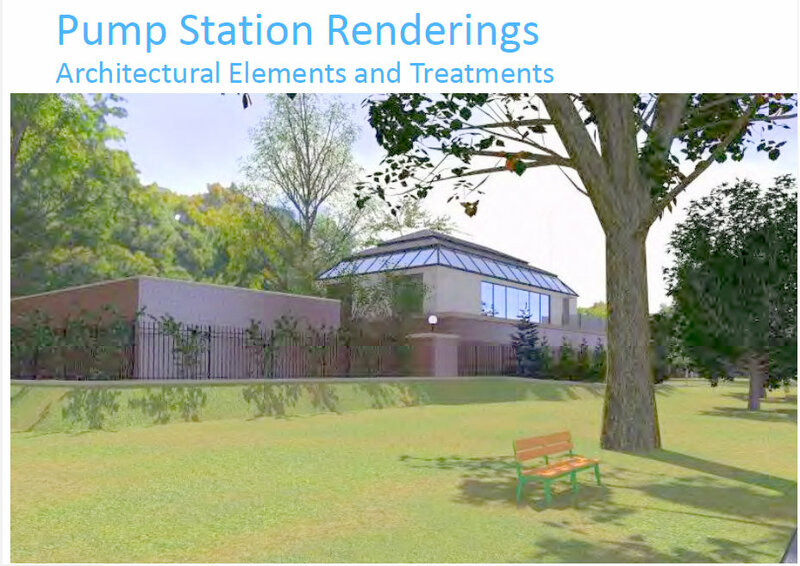 There is plenty of room on the 0.39-acre parcel where the Old Pump Station is located, if a new pumping station is really needed — especially since a new design need not be a rectangle to serve as the upper portion of a pumping station. For example, an L-shape would do just fine, even if the generous lawn behind the current pump station is not quite big enough. There apparently are no studies of the cost of building at other locations. Vince Riggi, City Councilman (Ind. ), had to introduce himself, waiting until near the end of the meeting. Mr. Riggi noted the primary importance of the opinion of the residents of the Stockade, because they must live with the results and its impact on the District and Park. He pointed out that he was the only person on the City Council to vote against the 2014 resolution to place the new pumping station in the Park rather than retrofitting the Old Pump House. He asked residents to let him know their concerns, e.g. by email [v_riggi@verizon.net]. I just want to thank all of our neighbors who turned out last night. I thought the questions and comments were insightful and helpful and I learned some new information and new perspectives. Can’t ask for much more from a meeting. We have a lot of intelligent and interested neighbors which is a good thing. That’s a pretty good summary and leaves me more optimistic than is often warranted that the Stockade Association will work hard to achieve the will of its members, for the good of the Historic District. For more information, including images of the beautiful West Lawn of Riverside Park, please go to tinyurl.com/WLawn. If you have other details or corrections or nuances to the items above, please leave a Comment. Go to tinyurl.com/2016SAPicnic to see images from the 2016 Stockade Association Picnic, a lovely event at a beautiful location. update (May 8, 2017): The Stockade Association Board decided at its May 3rd meeting to put the new Pump Station location on the agenda of the Annual Meeting, May 18, 2017 (7 PM at the St. George’s Great Hall). follow-up (May 21, 2017): At its May 18, 2017 Annual Meeting, the membership of the Stockade Association voted overwhelmingly for the following motion, and for a second motion to make up to $4000 available to implement SA’s opposition. 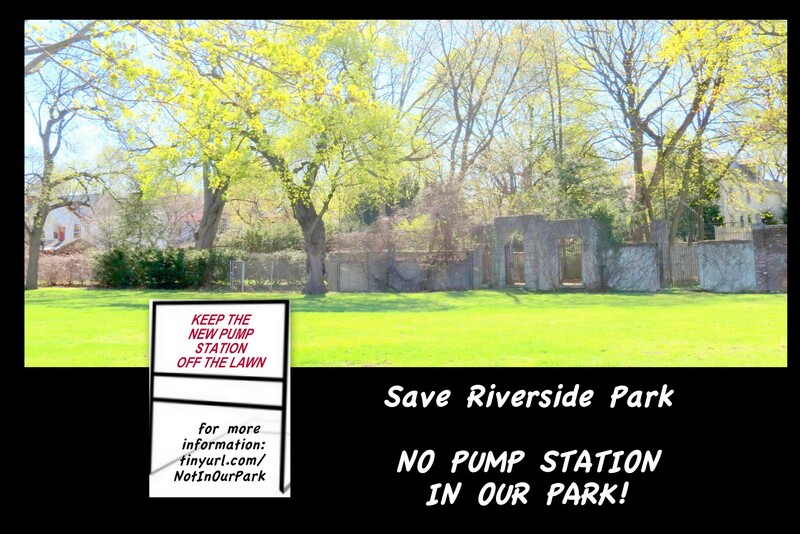 Regarding the Stockade Association’s position on the proposed new pump station in Riverside Park: As a follow up to our request in May 2014, we move that the membership of the Stockade Association strongly oppose the alienation of any park land; and the construction of any new structures outside the fenced area of the existing Pump Station. We also demand a thorough vetting by the city of all other options in a transparent and inclusive manner. follow-up: Two resolutions passed by the City of Schenectady City Council on June 12, 2017, represent a compromise solution that we hope will sacrifice, at most, less than 0.1 acre of parkland at Riverside Park. See the posting “what the parkland alienation resolutions mean” (June 12, 2017), at suns along the Mohawk.